Last Song Before Night is a book that I was really looking forward to. It’s a debut work by Ilana C. Myer, and sets itself up for being something rather big, and impressively epic. However, it also focuses on poets and music, two things that I’m both tired of reading about, and really love taking a central role in my books if it’s done right. I had high hopes, and my experience with this novel largely lived up to them. Last Song Before Night is character driven, but as with most good characters, each individual in this story has multiple layers, as does the book as a whole. Things start out on the surface, and slowly the author delves deeper. As you move through the book, you’ll realize that the characters and the plot are evolving in surprising, impressive ways. 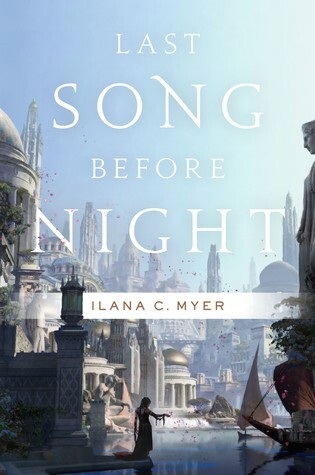 Myer crafted her novel subtly, and much like any good song, the beginning and the ending are just memorable transitions to (and from) the epic crescendos and decrescendos of the work as a whole. Last Song Before Night has multiple character perspectives. It’s interesting to note that each character, in some way, is lying to themselves and those around them and in that respect this book is a puzzle as readers try to puzzle out just who each character really is and what their true motivations are. It takes time for some of them to show the reader their secrets, while others wear it on their shoulders and are easy to pick out. Even the character(s) that seemed “bad” to me weren’t exactly who they seemed to be. They evolved, and while I never really warmed to them, they ended up being different than who I expected, with motivations that sometimes surprised me, if they sort of lacked a bit of the creativity I found in other characters. The plot of this book is intricate, though it takes time to warm up and really get moving. Some readers might be put off by a somewhat slow start, and things don’t really get going until closer to the halfway point. However, the start of the novel isn’t uninteresting. In fact, I was captivated despite the fact that I couldn’t quite see where things were going. The world building is deft, and the musical and artistic qualities of the novel enchanted me. Like I mentioned above, this is a novel that has layers, and things aren’t always what they seem. It takes some time for the author to build up all those layers, but it’s done in a rather subtle, artistic way that caused me to enjoy each part of the book for what it was. I’ve seen this book compared to Guy Gavriel Kay’s work, and in a lot of ways I completely agree. There is something to be said for the impressive talent the author has, her subtle crafting, and the lyrical quality of her prose. The world building was delightful and well thought out, and the characters were absolutely captivating. There are a lot of elements that play homage to epic fantasy roots – the magic, the sense of wonder and delight that never quite fades regardless of what is going on, and the quest itself as well as the group of people who embark upon it. It is a wonderful adventure, and an intricate song in just about every respect. There is a real tug of war that takes place throughout the book as characters have to give and take to make things happen. Often people are strained in interesting, uncomfortable ways, and those strains create fascinating plot elements. Not everything is easy, and many of these struggles that are faced force characters to face who they really are, and grow as a result. Furthermore, Myer has a wonderful way of challenging many old conventions in subtle ways without beating readers over the head with it all. Last Song Before Night is a fantastic blend of old and new ideas. It pays homage to its epic fantasy roots, while moving into uncharted territory. Once things get going, they really get going. I found myself addicted to this book from the first page. I enjoyed the character development, the smooth and lyrical prose, the artistic quality to the work that appealed to my own inner musician and artist. The world building was beautiful, and the magic system was well crafted. Some readers might find the slow start a little troublesome, and there are some aspects of the magic system that didn’t seem completely believable in the context of the work as a whole, but those are small issues when compared to the high quality of this debut work. Last Song Before Night is a debut the author should be proud of. It is addicting, artistic, and completely magical.